Pratibha and Ashwin’s story is not a cliché, fairytale love story. There was no love at first sight and all that drama. It all started out with just a solid base of friendship before they decided to spend their lives together. The two met in Melbourne, while volunteering for the same social club at college. And just like other university students, they simply hung out. But what was striking was that they were and still are poles apart but still shared the same goals. Almost like their paths were different but the destination was the same. Destiny doing it right, I suppose! But what we really loved about this couple is how adorably they spoke of one another. #relationshipgoals! 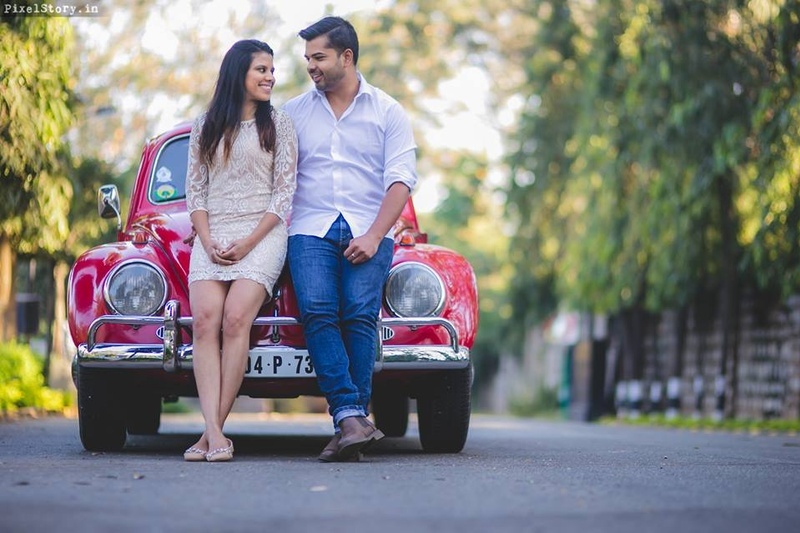 Pratibha and Ashwin’s pre-wedding shoot by PixelStory.in was all about peaceful, romantic vintage vibes. Our bride-to-be donned a classy beige dress with net overlay while Ashwin sported a casual look in jeans and a white shirt. They even had a bright red retro car to add to the backdrop that wrapped up the colour palette splendidly. As Pratibha and Ashwin come from different cultural backgrounds – she, being a Kannadiga Hindu and him, an Anglo-Indian Catholic, the decided to have the best of both worlds at Taj West End, Bangalore. Plus, as most of their guests were traveling from overseas, they felt that giving them the feel of an authentic Indian wedding would be ideal. This cross-cultural wedding started off with a South Indian style wedding ceremony co-ordinated by Pratibha’s mum, all with the help of the meticulous wedding planners at 3 Productions. With only 200 guests, they wanted it to be intimate and traditionally South Indian. Pratibha looked quintessentially beautiful in a pink-red saree with gold hints from Mysore Saree Udyog while Ashwin kept it simple in a toned-down gold ensemble. In terms of décor, they chose pastel hues. 3 Productions suggested having marquees for an added touch of elegance. They even had a bridal party that served as the Catholic touch to a solemn South Indian ceremony. The after party was everything Anglo, from having Ashwin’s guitar teacher’s band from Coonoor playing on the night to the Grand March to the vintage chandelier – it was exactly what they had envisioned. Pratibha chose to wear a beige fishtail gown with black lace adornment that was bought from Duchess Boutique in Melbourne. The groom looked dashing, sporting a suit by Peter Jackson, Melbourne. The eventful night included the first dance, the father-daughter dance, a toast by Ashwin’s uncle, the maid of honour speech and bride and bride groom speeches.